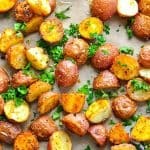 These Seasoned Oven Roasted Potatoes are crispy on the outside, tender on the inside, and perfectly flavored with herbs and spices for an easy side dish any night of the week! 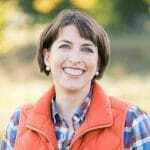 Even though I married a meat-and-potatoes lover, potatoes rarely made it into my grocery cart because I had yet to find a recipe that my boys would gladly eat (besides the fried variety!). Something about the texture of mashed potatoes just doesn’t appeal to them. That’s how you know that this dish is a keeper: even non-potato eaters will change their minds once they try them! Plus, this red potato recipe comes together quickly, thanks to the help of a seasoning packet. 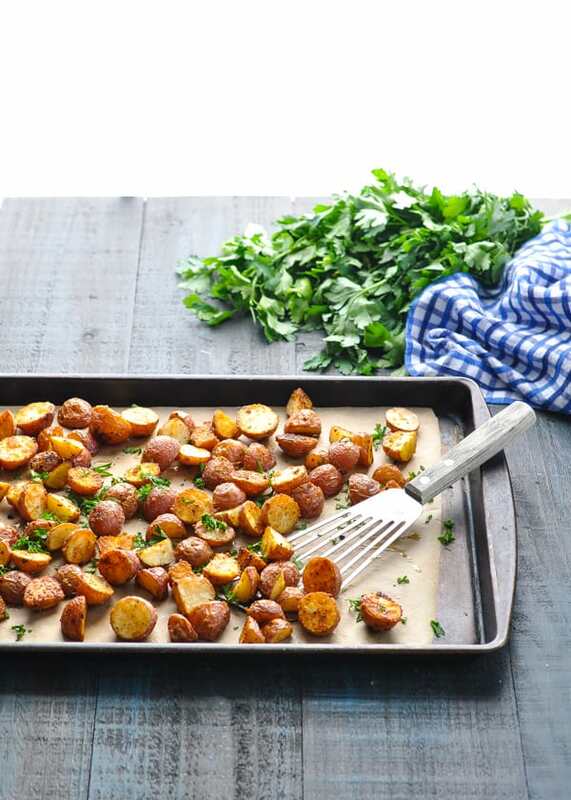 Served with just about any main dish protein, the quick roasted potatoes are a crowd pleasing side dish that the whole family will love! 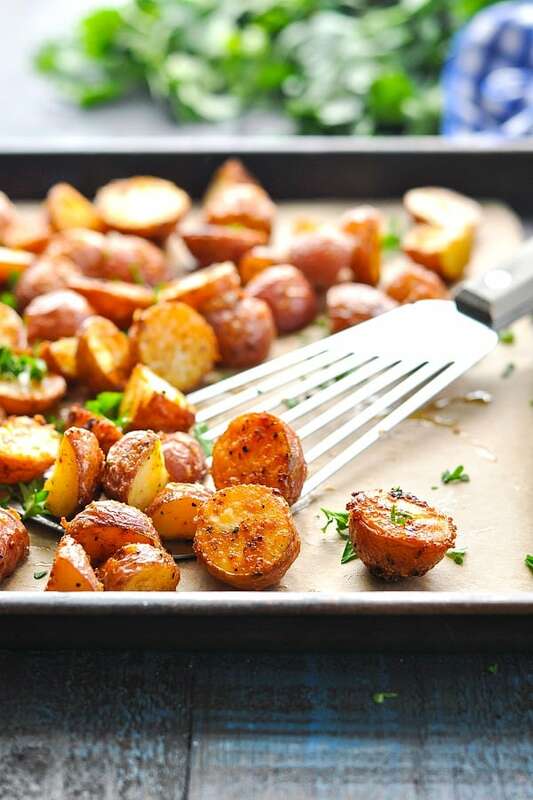 You only need a few simple ingredients to make these herb roasted potatoes: red potatoes, olive oil, Italian salad dressing mix, garlic powder, salt and pepper. First, chop the potatoes into halves or quarters. If you have particularly petite potatoes, they can just be cut in half. Otherwise I like to cut the potatoes into quarters for small, bite-sized pieces that cook quickly in the oven. 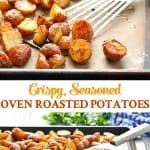 How do I make oven roasted potatoes crispy? 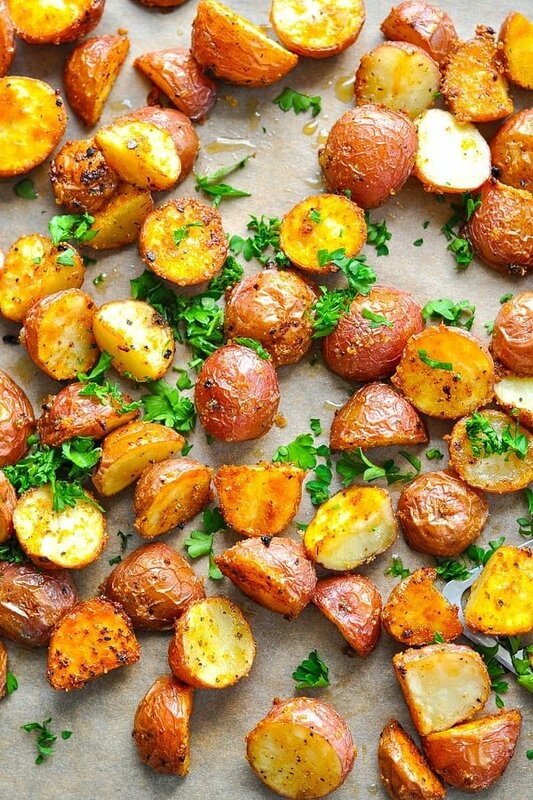 There are 2 main keys to getting crispy roasted potatoes: a very hot oven, and plenty of olive oil to coat the potatoes. For the herb seasoning mixture that dresses the potatoes, I like to use a packet of Italian salad dressing mix. 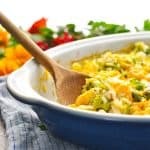 It’s a great shortcut option that gives this recipe a ton of flavor, without too much measuring or shopping for spices. 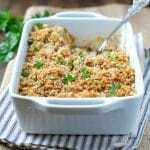 Do NOT prepare the salad dressing according to the package instructions — simply use the packet of dry seasoning and whisk it together with olive oil, garlic powder, salt and pepper. 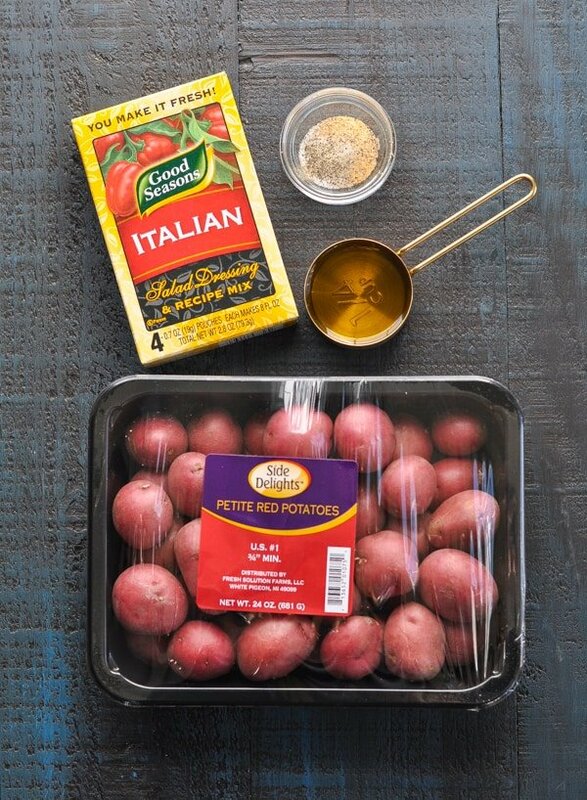 Pour the olive oil mixture into a large plastic bag with the diced red potatoes, and toss everything together to make sure that the potatoes are well coated. Spread the potatoes in a single layer on a baking sheet and they’re ready for the oven! How long does it take to roast potatoes at 400 degrees F? The potatoes roast in a 400 degree F oven for about 30 minutes. Be sure to stir the potatoes every 10-15 minutes to be sure that they brown evenly. You know that the oven roasted red potatoes are done when they’re crispy on the outside and tender on the inside! Can oven roasted potatoes be frozen? I do NOT recommend freezing these potatoes before baking. Frozen potatoes can have a grainy, “off” texture when they’re later baked. 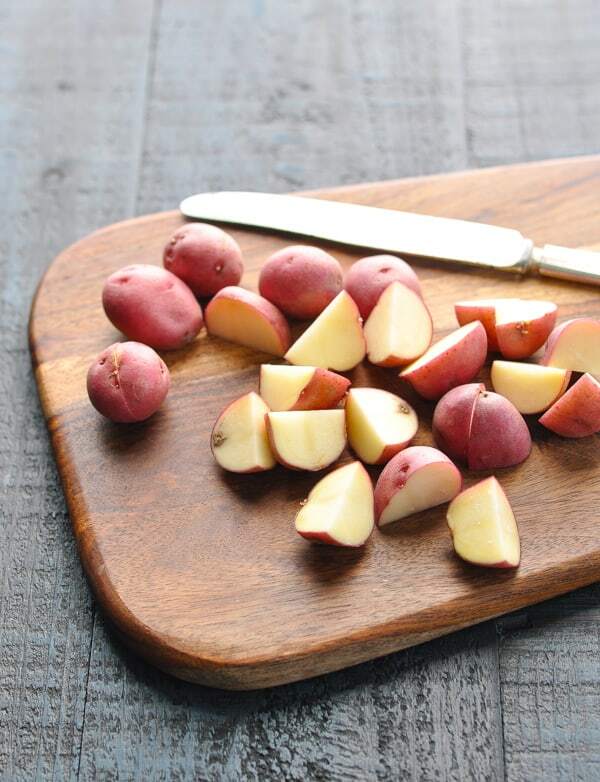 If you have leftover roasted potatoes that you would like to freeze and enjoy later, you can keep them wrapped tightly in your freezer for up to 2 months. 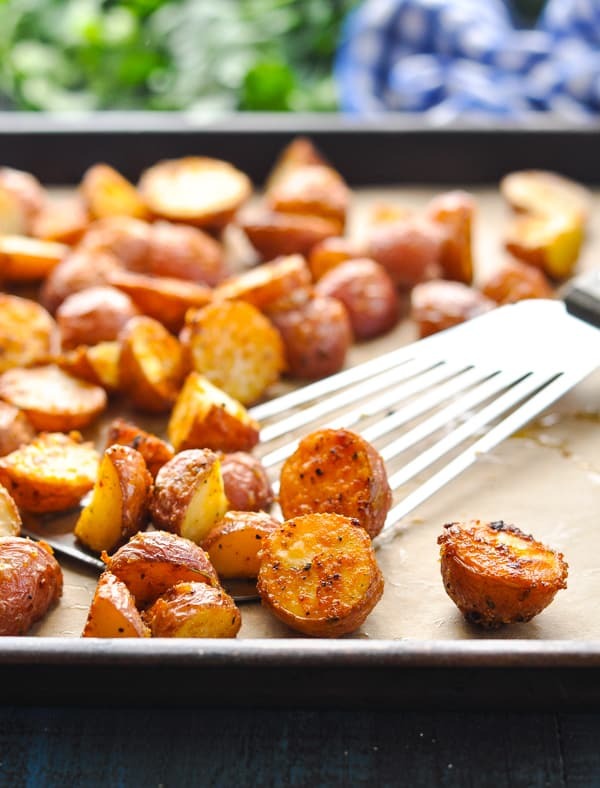 To reheat frozen oven roasted potatoes, spread the frozen potatoes on a baking sheet and re-roast in a 400-degree F oven until warmed through and crispy again (about 10-15 minutes). Do NOT prepare the Italian salad dressing according to the package instructions — simply use the packet of dry seasoning and whisk it together with the other ingredients. For a variation on the herb seasoned potatoes, try using a packet of Ranch dressing mix instead of the Italian dressing mix. Be sure to stir the potatoes every 10-15 minutes to be sure that they brown evenly. Don’t have baby red potatoes? You can substitute with Yukon gold potatoes instead. Just make sure that they’re diced into bite-sized pieces as well. Garnish with fresh herbs (such as chopped parsley) for a bright, flavorful finishing touch. Line a rimmed baking sheet with parchment or aluminum foil and spray with cooking spray. 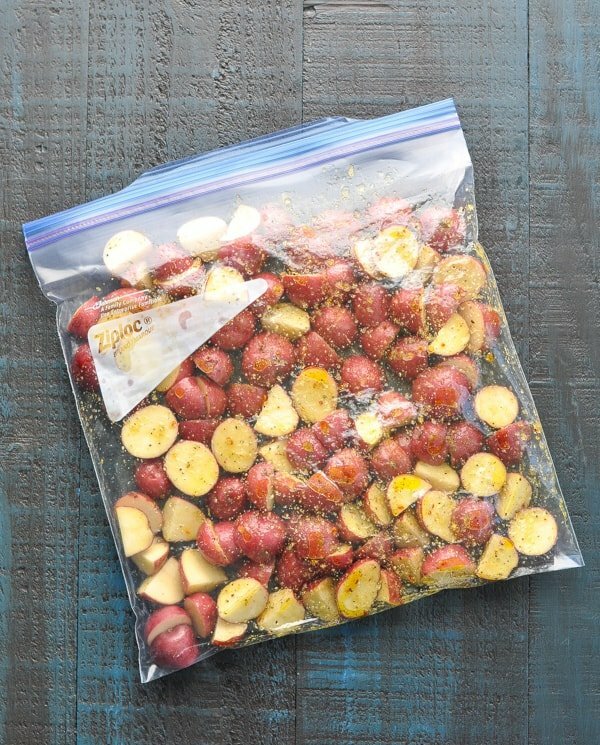 Place halved or quartered potatoes in a large zip-top plastic bag. 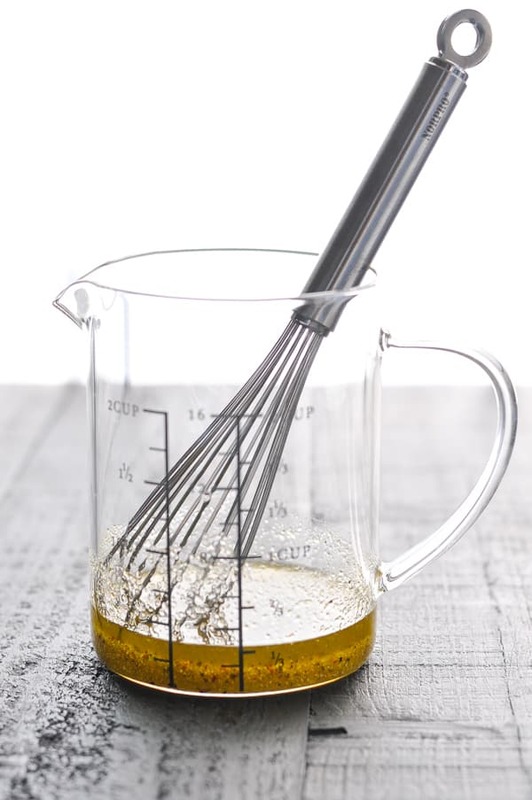 In a small bowl, whisk together dry Italian dressing mix, olive oil, garlic powder, salt, and pepper. Spread potatoes onto prepared baking sheet. Bake for 30-40 minutes, stirring with a spatula about every 10-15 minutes. Potatoes are done when they are crispy on the outside and tender on the inside. I do NOT recommend freezing these potatoes before baking. Frozen potatoes can have a grainy, "off" texture when they're later baked. Do NOT prepare the Italian salad dressing according to the package instructions -- simply use the packet of dry seasoning and whisk it together with the other ingredients. Don't have baby red potatoes? You can substitute with Yukon gold potatoes instead. Just make sure that they're diced into bite-sized pieces as well. These potatoes look awesome Blair – so perfectly crispy! Pinend! Thanks for sharing with us at Marvelous Monday! Pinning to my party board! I could eat potatoes every day! These sound great! 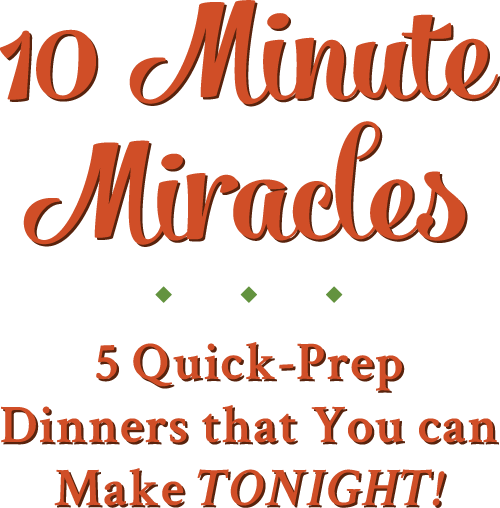 I would love it if you would share it on my Tasty Tuesday linky party going on now! Hi Penny! Thanks for stopping by! I will definitely head over to your party! Isn’t it awesome when you find something that the kids will actually eat!! My eldest daughter(4) will not touch any cooked potatoes, only the fried variety, from a shop. I am hopeless at getting them crispy on the outside, maybe I will have to try again. She may actually eat them. Hi, Alicia! Your daughter sounds exactly like my 4-year-old son. Definitely give these potatoes a try. This is the first recipe that I’ve made at home where the potatoes really are crispy on the outside…and delicious. She might just like them! Thanks for visiting, Patti! I hope that you love the potatoes! I don’t think I have ever made potatoes that looked this delicious! Clearly I need to follow your steps…!! 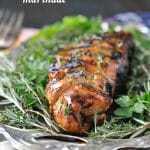 I made this with your London Broil. Great dinner. `I am always worried about not having enough food so I always double the amount I should make. . I offered the leftovers to take home and everyone grabbed the food. I was asked for the recipes too. Excellent recipes. I love all your recipes. I made these potatoes with the Balsmic Glazed Tenderloin and they were so good. It made me sad that I didn’t make enough for another helping. I difinantly will be making these potatoes again. Oh, and my “picky” husband loved them too. Hello, I would like to try this recipe. Please tell me what olive oil I should use??? You can use any olive oil that you like. I think that the best is a pure olive oil imported from Italy, but any variety that you have on hand is fine! I made these potatoes about two weeks ago and they were extremely good. I think the powdered dressing made such a unique difference . There weren’t any left overs and I made a lot. I will be making them again many times. 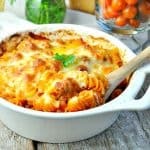 Tired your recipe and it’s great I just use 2 packs season instead of 1 for the extra flavor my Husband and I loved it !! !